December 3rd, 2015. Today the official Digimon Adventure tri. web portal announced that the first tri. film, Reunion, will have its Japanese three-week screening extended an additional week, with the end of its run in theaters set for December 18th. Adventure tri. has been consistently described as a big hit by Toei, and in its first week the film opened at 59 million yen despite being screened at just ten theaters. Currently Reunion is in its second week. As part of the film's original campaign, theatergoers were given one of several autographed illustrations featuring a different character from the tri. cast; for the fourth week two new illustrations are being distributed to keep up with demand, drawn by tri. 's animation character designer Shino Masanori and the film's animation director Ito Kouji. 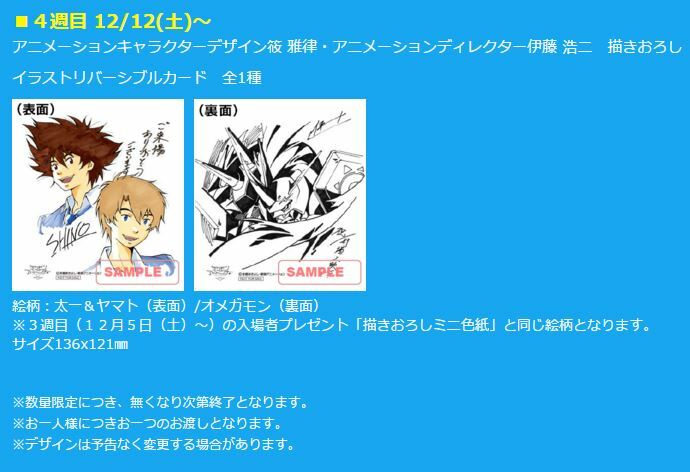 Shino's illustration features Taichi & Yamato, while Ito's features Omegamon. These will become available beginning on December 12th. Digimon Adventure tri. is a series of six theatrical films made in observance of Adventure's fifteenth anniversary. Currently two films have been titled, Reunion (premiered November 21st) and Decision, which will premiere in Japan on March 12th, 2016. For its international distribution, Reunion was officially licensed to be subtitled on Crunchyroll, broken up into four episodes rather than the one continuous movie shown in Japanese theaters. In Germany the film was subtitled by Animax and shown on broadcast television.